The UofT Demo Camp Series is a look at the up and coming software applications and technology being developed by some of the brightest young minds in the industry. Hosted by UofT's Web Startup Society and Entrepreneurship Club, the event saw the campus' most promising developers demo their latest projects for all to see. Welcome to the second post in the UofT Demo Camp Series. Today we'll take a look at an interesting social media/education platform that is designed to connect students with tutors trained in specific fields of expertise. To read the first post in the series, "Making Events More Engaging", click here. Ever found yourself panicking the day before an assignment is due, not fully understanding the material at hand and not having anyone to turn to for advice and instruction? With Teaching Assistants at a minimum, office hours a rarity, and the lack of a willing and knowledgeable group of classmates to help you out, you'd normally be stuck. What if there was a social media platform that would allow you to connect with and learn from experts - live and on-demand? 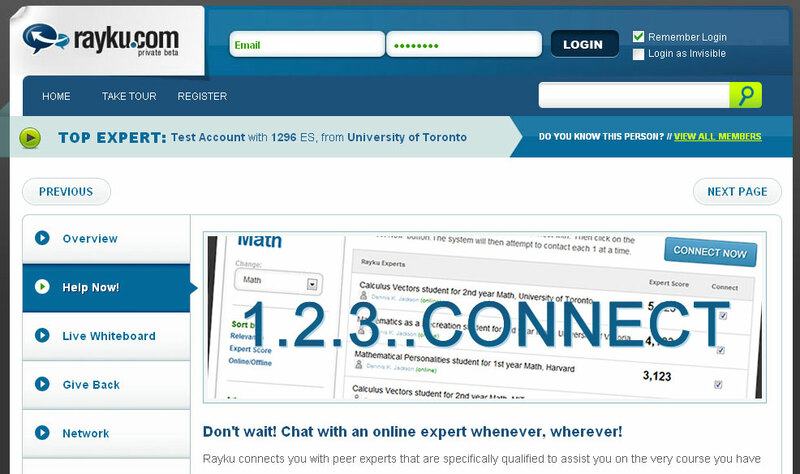 Rayku.com, which was presented by its creator, Donny Ouyang, is just that: a platform designed to connect students with subject experts and facilitate live online tutoring sessions. It works pretty simply - almost like a mixture between Facebook, Yahoo! Answers, and a live Webinar. Students sign up to be a part of the network and then post questions whenever they have a problem that they need advice on. Advice can be given by a pool of tutors who are experts in certain fields of study. Once student and tutor are connected, the they can communicate via a live chat and a virtual whiteboard can even be used to help explain concepts. Two things jumped out at me immediately as I listened to Donny explain his concept. 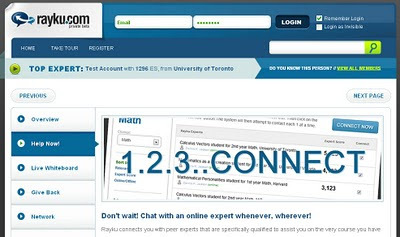 The first is that, although the interface used to help facilitate the actual tutoring sessions is pretty innovative and cool, the entire credibility of the platform is dependent on the relevancy of the matches. Unlike a crowdsourced questions and answers platform like Yahoo! Answers, in which users blast their questions to a large and broad audience, the entire concept of Rayku.com is designed around the idea of sending a question to a very small and specific audience. Because the "shotgun" approach of Yahoo! Answers reaches so many people, there are bound to be a few experts who can help you out (though their credibility may be in question). Rayku.com's "rifle" approach means that unless you're able to quickly match up with the expert who you're looking for - preferably someone who's taken and done well in the course before - the idea won't work. The second thing that jumped out at me was the issue of recruiting and keeping a large pool of engaged experts. In order for the concept to work, you would have to ensure that you have a good mix of experts on a wide variety of fields who are ready and willing to offer live help. They have to be engaged with the site, constantly accessible, and ready to offer exceptional "customer service", so to speak, when ever a request is made. Although the platform does offer "Rayku points" that tutors can collect and spend on various products and rewards offered through the site, I wonder if that's enough. Taking the time to tutor someone through an exercise takes a lot of time and effort, but one of the great benefits of one-on-one tutoring is being able to see the progress your student has made over time, coaching them along the way. Since Rayku.com encourages the opposite - quick, on-demand tutoring sessions with complete strangers - I'd be hard-pressed as a tutor to gain any real satisfaction from offering my services. It's got potential. The student insight is bang-on and there is definitely a need out there for something like this. I could see "subject matter expert" platforms like this becoming extremely popular in the future beyond just the educational space. Imaging connecting with expert housekeepers for advice on cooking or cleaning your house, or a fashion expert when looking to choose an outfit for a fun night out. That said, I think the tutor insight needs more thought put to it. Connecting the right expert with the right question is crucial, while finding a compelling reason for tutors to stay engaged with the platform (beyond points or monetary rewards) and replacing the satisfaction of being a true mentor will be crucial to the platform's success. What do you think of Rayku.com?